Ten 13 Old Dogs Can Learn New Tricks! Cognition – or thoughts – are what determine how persons understand the world around them and act (or react) within it. At their root, cognition is based on one’s belief system. What you believe about yourself and the world determines your thoughts about it, which in turn determine your actions. With a few exceptions, every human action is part of a set of thinking processes. Your cognitive abilities are the brain-based skills required to complete any task – from the simplest to the most complex. Instead of being based on actual knowledge, these abilities are more closely associated with the way we learn, solve problems, and remember. Every experience changes your brain’s organization at some level. This change in organization is believed to be alterations in brain dynamics. Recent research has found that the brain is not a fixed, limited system that only degrades with age. Instead, it has “plasticity,” the ability to change. Not only can the brain change but it can also create new neurons and connections between neurons throughout our lifetime. This creative process is known as neurogenesis (sometimes known as synaptogenesis – there is a difference but I won’t get into it here). 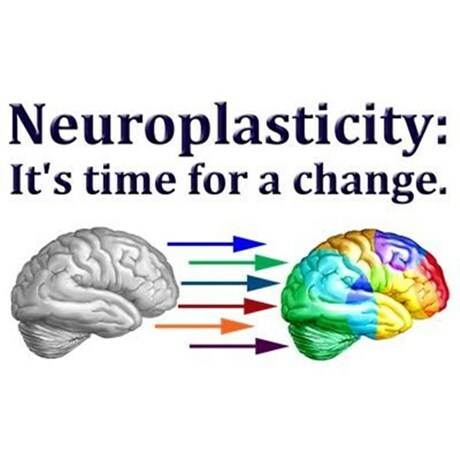 Brain plasticity or neuroplasticity is the capacity of the brain to change and rewire itself as it responds to stimulation, specifically learning and experience. As we grow older, this rate of change may slow down but it never stops. Cognitive psychology and coaching are built around this framework that cognition and brain function can be changed, thus altering one’s behavior. An old dog can be taught new tricks. Being a lifelong learner has always been important. In fact, it is a primary trait of great leaders. Today, when combined with the neuroscience of brain plasticity, lifelong learning takes on a whole new meaning. Now, it’s a matter of brain health and well-being. The process of learning and expanding your knowledge creates a physical change in your brain. Through neuroplasticity, learning increases cellular metabolism, the production of brain chemicals that maintain and repair neurons, and neuron connections. You can do this by practicing a new skill, reading a book, training (fitness or even professional development), personal development exercises, and a whole host of other activities. You’ve heard it said, practice makes perfect. I would disagree. I believe “practice makes permanent” and the neuroscience would seem to support this view. Practicing anything continually stimulates the same area of the brain, strengthening existing neural connections and creating new ones. Over time, we become cognitively efficient, using fewer neurons to do the same job. the more frequently particular mental circuits are used, the more effortless it is to get them fired up again. My dad always taught me, “everything is easy, once you know how.” And he’s right. Brain fitness is simply the ability of your brain to experience neuroplasticity. Creating additional connections between neurons and promoting new neurons is the result of vigorous mental activity. This translates to a sharper memory, better attention, and overall improvement in cognitive skills. Coaching is aimed at changing the trajectory of a person’s life by drawing out of them perspectives and strategies they did not realize they had. Helping them consider, ponder, and “exercise their brain” in ways previously untapped is how coaches get the best from clients. Coaching as a leadership methodology can help change the trajectory of both a person’s career and their influence on the organization…both in positive directions. There is no denying the influence of coaching on current leadership models. “Leader as coach” is catching on and is serving as a powerful way to empower employees. Providing the freedom to access previously untapped energy and perspectives allows employees to dig deeper take risks that payoff in big dividends. Not only does this precipitate highly motivated and fulfilled team members who enjoy what they are doing, they are also more effective. Coaching – for both employees and leaders alike – also generates this “vigorous mental activity” that promotes brain fitness. Who doesn’t want healthy brains for themselves and their employees? Coaching is not about solving problems per se, although problems are resolved. Coaching involves listening for understanding, asking powerful and insightful questions, and stimulating one’s awareness and curiosity. Coaching helps persons see new perspectives and identify possible options, encouraging them find their own solutions and answers. All this is done while simultaneously supporting the path of change and challenging continued progress with reassurance, accountability, and discovering the already possessed resources needed for success. In short, coaching promotes brain fitness. For more information about personal or professional coaching, contact Dr. David Turpen at DrDave@DTLifeCoach.com, visit DTLifeCoach.com, or call 877.759.5582. Fernandez, A., & Goldberg, E. (2009). The sharpbrains guide to brain fitness: 18 interviews with scientists, practical advice, and product reviews, to keep your brain sharp. SharpBrains.com. Carr, N. (2011). The shallows: What the Internet is doing to our brains. WW Norton & Company.